The X-Men have always been the outsiders of the Marvel Universe. Things never really change of resolve in their world as things are about evolution, with things pointing to them being the next stage of human evolution. But the X-Men have always stood up for equality, this is something that goes back to their very early days and was how Stan Lee and Jack Kirby originally invisaged them. House of M is one of those stories that is told through a 'comic book event', a re-defining change in the comic book landscape that promises major changes in its wake when everything is said and done. The only reason they do these massive crossover events, is so that the distributers can get as much of the comic book collectors money as possible! And nowadays those events are done far too often and aren't done right! House of M finds its roots in the storyline Avengers: Dissembled. The Scarlet Witch, the daughter of Magneto, finally lost control of her sanity and her reality warping abilities. During the conflict, she makes Tony Stark believe he has taken up drinking, resurrect's the dead Ant-Man Scott Lang, critically injures a number of her teammates including Wasp, Lionheart and She-Hulk, launches an attack from Ultron killing her former husband, Vision and brings an alien armada to Earth, killing Hawkeye in the process. Its safe to say she has gone a little bit loopy. Professor X and Magneto, both trying to rebuild Genosha, a mutant haven decimated by Cassandra Nova in New X-Men, take her in and try to bring her back to normality. House of M just can't help but remind us of the Age of Apocalypse/Onslaught saga from the ninties. In both of those storylines, reality gets altered and there is a quest our heroes have to go to put things right. Reality finally gets unaltered and our heroes return to normal with only a few lasting consequencies. And we can't help but expect House of M to be truely brilliant when it comes from fan-favourite author, Brian Michael-Bendis. At the time this series was originally published, he seemed to be writing every comic book in existance, The Avengers, The New Avengers, Ultimate Spider-Man, Daredevil and The Pulse, all of whom are pitched in here in some shape or form and from House of M, he went on to become one of the caretakers of the Marvel universe, delivering large epic stories like Civil War, Secret Invasion, Dark Avengers, Siege and Fear Itself as well as seeing in Marvel The Heroic Age to name but a few. Scattered throughout the pages of House of M, there are few nods to things that Bendis does best, engaging dialogue, super-hero tension and extented exposition. 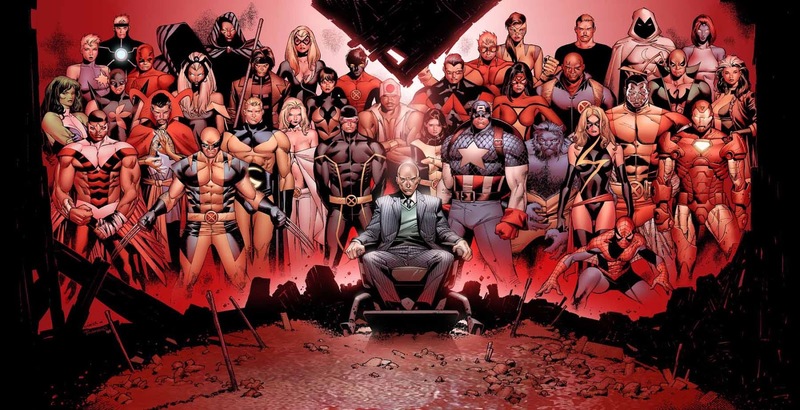 The Avengers and the X-Men have both agreed that the Scarlet Witch needed to be dealt with, perhaps permenatly and they follow Professor X to Genosha to try and finish her off. But things are now different, Genosha is restored and one of the Earths biggest powers and everyone seems to have everything they ever wanted. Peter Parker not only has his Uncle Ben back but is married to Gwen Stacy and has a child. Emma Frost and Scott Summers are married, Ms. Marvel is the worlds most famous superhero. Things are coming up roses for everyone and as far as people are concerned, this is how things have always been. It is an interesting look at these heroes we have followed for so long and seeing them get what their heart believes they desire is an enjoyable enough little jaunt. But House of M is more than that. It is has a sort of spirtiualism about it, although the heroes have everything they ever wanted, it is all about regrets and reclaiming moments, the ones which are lost in life and getting to live them again. We all dream of getting second shots at different events in our lives in an attempt to live them how we want, without realising how selfish this really is. Of course, this all points to peoples desires to be gods, determiners of our own fates without realising that we might be the problem. We all know people whose lives didn't turn out how they wanted so they moved away to start again. Then their lives go down the same paths again because the problems lie within them and it doesn't matter how far we run, the problems will always be there. This book taps into our desires to be rescued from past transgretions, from out of control moments in our lives. But all too often do we believe ourselves to be too far gone, too sinful and too tainted to be loved and accepted. At its heart, this book reminds us that it never is, we can always become the people we were meant to be. House of M also had to deal with something going on behind the scenes at Marvel, the mutant problem. There were so many mutants in the X-Men mythos that is far to difficult to keep track of them all. The decision was made to drastically reduce that number. The most popular X-Men would retain their powers, as well as ones who would feature in future stories but the others would find themselves depowered. With Wolverine being the only one who remembers the way the world was, he goes around and rallies the heroes and they perform one final assult on Genosha. This is when things start to go very badly. We find out that it was Quicksilver, the brother of The Scarlet Witch and son of Magneto, who persuaded his sister into changing the world. When Magneto discovers the truth, it is fair to say he goes worse than crazy. We've seen Magneto mildly annoyed before but never like this. In his attack, he accidently kills Quicksilver and this is the straw that finally broke the camels back. The Scarlet Witch drops down beside her dead brother and blaims the mutants. Everything that went wrong in her life started with the X-Men. She mutters the immortal words, "No More Mutants" and just like that, the mutant population is reduced to 198.